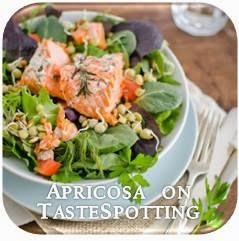 I have been enjoying a number of delicious salads recently, all of them centered on a fantastic foursome of summery ingredients. 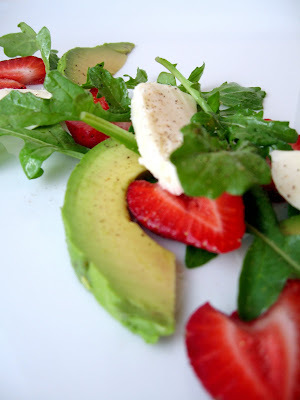 It started off as an appetizer: arugula tossed in a lemon vinaigrette, with creamy avocado, perfectly-ripe summer strawberries, and fresh mozzarella, sprinkled with sea salt and freshly-ground black pepper. You don't need to do anything complicated to treat your senses. But then I couldn't help myself. The next day I took the same four ingredients and added chopped cabbage and lettuce, thinly-sliced celery, and fresh corn shaved from the cob. That was pretty good too. What a salad! Place all ingredients in a glass jar and seal shut. Shake well until emulsified. Store refrigerated up to 1 week. Oh Erica, what a lovely salad, I love when food look that good. For me the pleasure starts with the look. Great combination strawberries and avocado. Thank you for commenting in my new site. You are my first. Yurruuuul. Have a beautiful weekend. 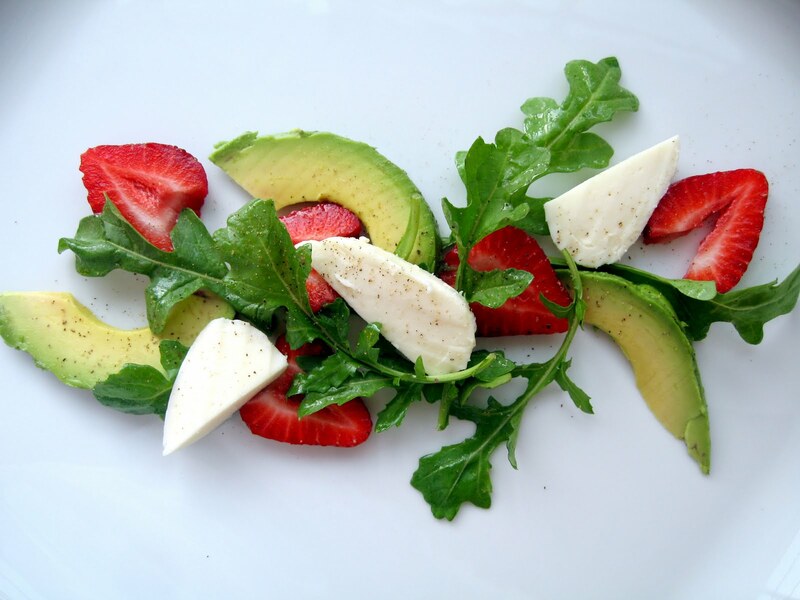 Your salad recipe looks delicious! The California Strawberry Commission would like to post the link at www.facebook.com/castrawberries as one of our Wednesday WOW! Recipes. Feel free to check out our page and see how we credit bloggers. Please do not hesitate to reach out to me at if you have any questions. I look forward to hearing back from you.